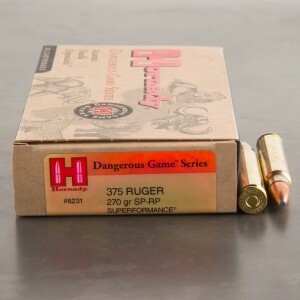 375 Ruger ammunition is a rimless, medium length cartridge designed for big game hunting. The round was designed to exceed the performance of the popular 375 H&H cartridge, yet it can still be chambered in a standard length action. 375 Ruger was released in 2007 and chambered in two of Ruger’s most popular rifles, the Ruger Hawkeye African, and the Ruger Hawkeye Alaska. 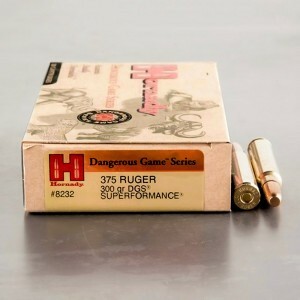 The 375 Ruger uses a proprietary case and therefore has no parent case. The design is rimless and has a base and rim diameter of .532. .532 is the same diameter of the belt on 300 H&H Magnum cases, and the 375 H&H magnum. This unique design gives the 375 Ruger greater case capacity than a belted magnum with the same case length. 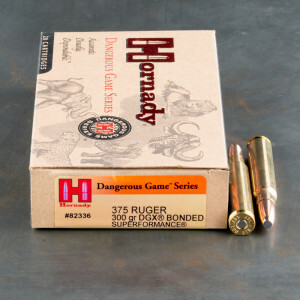 This design allows the 375 Ruger to be immensely powerful and incredibly capable as a hunting round - including dangerous and big game across the world. The 375 Ruger can propel a 300 grain bullet at a blistering 2,660 feet per second. The 375 Ruger’s length means it can be placed into the famed Ruger M77 rifle with little to no modifications.